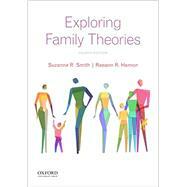 by Smith, Suzanne R.; Hamon, Raeann R.
Offering a diverse variety of perspectives, Exploring Family Theories, Fourth Edition, is a combined text/reader that integrates theory with research and applications. In each chapter, Suzanne R. Smith and Raeann R. Hamon present the history, scholarship, and critiques of one principal family theory in a concise manner. Numerous examples and illustrations augment and clarify content, while application questions help students relate these theories to the real world. After each chapter, a follow-up journal article exemplifies how that particular theory is used to guide actual research. Suzanne R. Smith is Associate Professor of Human Development at Washington State University Vancouver. Raeann R. Hamon is Distinguished Professor of Family Science and Gerontology and Chair of the Human Development and Family Science Department at Messiah College.